It has been announced today that the Discovery Park Group have purchased a major share (80%) in the Manston Airport site. With this, plans for a mixed use development of housing and industrial units have been announced. This would take over 20 years to develop, if planning permission and change of use consent was to be first given. 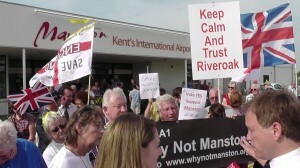 Supporters of Manston Airport continues to fight on to save the site for aviation use – in partnership with Thanet District Council, council leader Iris Johnston, Thanet Conservative leader Bob Bayford and MP Sir Roger Gale – all of whom have voiced their support for the continuation of the airport and compulsory order process. We understand that RiverOak, potential indemnity partner, are also still interested in acquiring the site. The acquisition of a major shareholding in Manston Airport by the Discovery Park Group should not deflect the determination of those who wish to see Manston reopened as an operating airfield says Manston`s MP, Sir Roger Gale. “Mr Cartner has indicated to me that his company has taken a major shareholding in the company that owns Manston with the former owner, Ms. Gloag, retaining an interest in the site. I understand that Mr. Cartner has potential clients that` cannot be accommodated on the former Pfizer site (Discovery Park)` and that he wishes to locate at Manston. Mr Cartner has suggested the possibility of significant investment and the creation of `up to 4,000 jobs` over a 20-year period which to me sounds remarkably like opportunist land-banking. My own position, which remains as before and which I have stated in terms to Mr. Cartner, is that I believe that it is in both the national and the local interest for Manston to remain open as an airfield, that if he wishes to pursue that route alongside airport related industries then he will have my support and that if he wishes to tear up the airfield and smother the land in industrial premises that can and should be located elsewhere in Thanet, or to assist Ms. Gloag in the realisation of her plan to create a significant housing development , then I shall oppose his plans in the interests of those that I represent. I have spoken to the Leader of Thanet Council, who I believe remains robust in her view of the future of Manston, to indicate my own continued political support for the compulsory purchase process, I have spoken with the Leader of the (Conservative) Opposition, Bob Bayford, who is equally resolute in his view and I have also spoken with the Directors of RiverOak, the company that wishes to buy and operate the airfield, who have told me that they remain determined in their aspiration to create an international freight hub and airport-related businesses at Manston. The council has today (Tuesday 23 September) been informed that the Manston Airport site has been bought by regeneration specialists, Trevor Cartner and Chris Musgrave – part of the Discovery Park consortium responsible for developing the Pfizer site in Sandwich. As part of the news, the council also understands that a new proposal for the site will be suggested – a mixed use scheme which the partnership envisages will create more than 4,000 jobs but would not retain the airport. The council is already part-way through a process to review whether compulsory purchase of the site is a viable option following a petition presented to the council on 10 July. The outcome of a soft-market testing exercise to identify suitable indemnity partners to cover all of the associated costs of a CPO will be taken to Cabinet on Thursday 16 October. The council will then undertake a wider review of the options for the site and as part of this would seek further details from the new site owners to understand more about their proposal. A report outlining all of the options for the future of the privately-owned site will then be brought to a Full Council meeting for all 56 Councillors to consider. The council has been clear that a CPO will not go ahead unless there is evidence of the economic viability of the site operating as an airport and a suitable investor identified to cover all of the costs required.